Lovina beach has become a popular destination in North Bali due to the area’s resident dolphins. Although Dolphin watching tours are seen as one of the best things to do in Lovina, unfortunately they aren’t actually as ethical as you might hope. Thankfully, the area still has plenty of other great things to do! 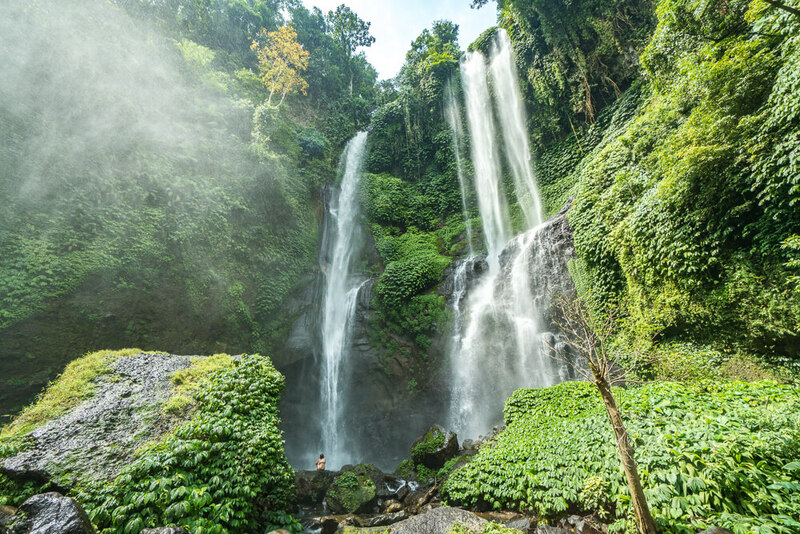 Lovina is close to some of the best waterfalls in North Bali – including the impressive Sekumpul waterfall and the Banyumala twin waterfall just outside Munduk. While we’d recommend skipping the dolphin tours in Lovina, the area is still definitely worth a visit so be sure to check out our guide to the best places to stay in Lovina. 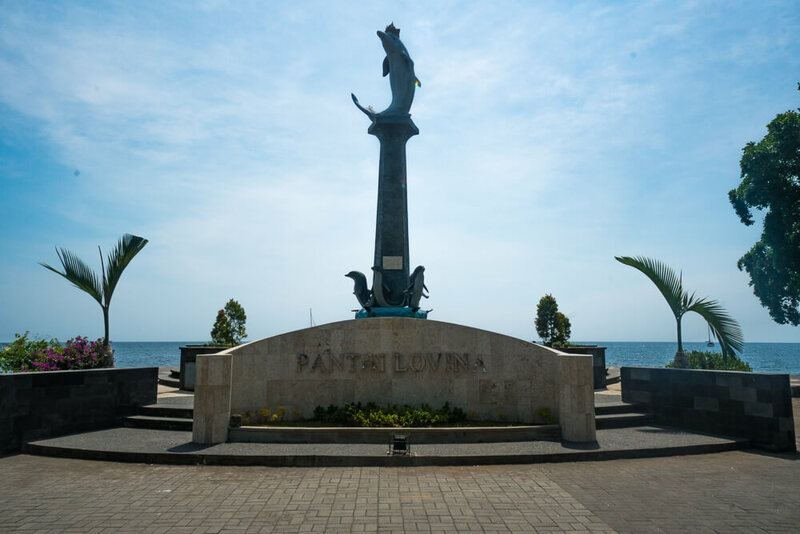 Find out everything you need to know about the area with this Lovina guide. Make sure you have everything you need for your trip with our packing guide for Bali! Public transport in Bali is virtually non existent for tourists. If you’re hoping to travel by public transport, you’ll have to use Bemos – small minibuses running set routes. Bemo routes are quite complicated and unless you find someone who knows the routes, then it’s hard to get around this way. If you want to try and get to Lovina this way, we recommend reading this guide to travelling by Bemo in Bali. Realistically, you’re better off getting to Lovina by shuttle bus or taxi. Find out exactly how to do that and cost information below. Shuttle – It’s possible to get between most places in Bali by shuttle bus. You can either arrange this at one of the many travel agencies on the street, or book online in advance. Prices will vary depending on where you’re coming from, which agency you book with and your negotiation skills. Perama Tours offer very reasonably priced shuttles. To get from Ubud or Kuta to Lovina it costs just 125,000 IDR when booked through their website. It’s unlikely that you will find a better price than this at a travel agency on the street. Click here to take a look at Perama Tours’ full schedule and to book your transport from a number of places in Bali to Lovina. Taxi – Taxis are available to take you from anywhere in Bali to Lovina. We recommend finding a driver online local to the area that you’re staying, and then negotiating a price via Whatsapp. Originally we were quoted 350,000 IDR for the one hour drive from Munduk to Lovina but after messaging a number of drivers we were able to negotiate it down to 220,000 IDR. Drivers on the street will often quote higher prices, but if you just google taxi drivers in the area you’re staying they are generally more professional and willing to negotiate. Lovina itself is relatively small and so everything you need is within walking distance. For exploring the surrounding areas you’ll either want to rent a scooter or hire a taxi driver for the day. We paid 550,000 IDR for a full day trip to 5 waterfalls in the North of Bali with 007 transport Bali. Renting a scooter for a day should cost around 60,000 IDR. 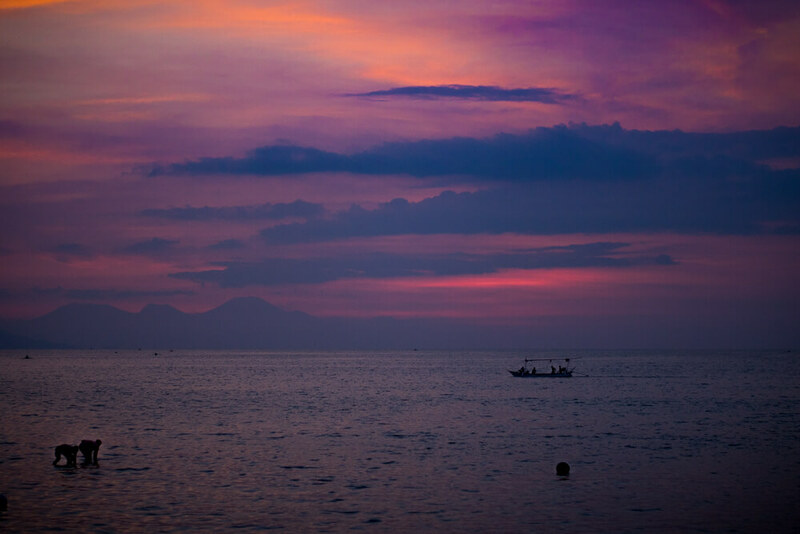 Bali’s dry season runs from April to September, making this the best time to visit Lovina for good weather. The rainiest months are December, January and February, and the weather can be quite bad during this period. If you do visit at this time of year it means the waterfalls will be more powerful. If you’re hoping to avoid crowds then don’t visit in July and August as this is the busiest time of year. Waterfalls – Some of the best waterfalls in Bali are found in the north of the island, and can easily be visited on a day trip from Lovina. Our favourite waterfalls in North Bali were Sekumpul waterfall and Banyumala twin waterfall. Other waterfalls near to this part of Bali are Gitgit waterfall, Jembong waterfall and Aling Aling waterfall (which is covered in greater detail below!). Hiring a driver for a day should cost around 550,000 IDR, although if you ask a driver on the street in Lovina they are likely to quote you a much higher price than this. We recommend finding a driver online and messaging them on Whatsapp to negotiate a price. We recommend using 007 transport Bali if you need a taxi driver in Lovina. If you want to make your own way there, you can rent a scooter for around 60,000 IDR a day. Snorkelling/Diving – There are a number of dive operators in Lovina that run daily snorkelling and diving trips. One of the best areas to snorkel and dive near Lovina is Menjangan island. At Menjangan island there’s plenty of marine life to see – from lionfish to moray eels to reef sharks. If you’re lucky you may even see manta rays or whale sharks. Click here for more information about diving at Menjangan Island. Other popular areas to take a diving or snorkelling trip from Lovina are Amed and Tulamben. On top of this there are some areas to snorkel and dive in Lovina itself. Before booking, we recommend checking whether an operator is affiliated with PADI. There have been reports of people being sold unlicensed trips in Lovina, and so it’s best to pay more to go with a legitimate operator. Click here to check for PADI dive shops in Lovina. Prices for diving and snorkelling will vary depending on the operator you go with. Dolphin watching – One of the main things to do in Lovina, Bali, is a morning dolphin watching tour. Although these tours do represent a good chance to see dolphins in the wild, they aren’t run with the dolphins wellbeing in mind. There are at least 20 boats a day all relentlessly chasing after dolphins for tourists’ enjoyment. Some days there are around 100 boats doing this. We opted against going on one of these tours as we didn’t feel comfortable with disturbing the dolphins in this way. Tours cost around 100,000 Rupiah, although we’d recommend against doing them as there are more ethical ways to see dolphins. We saw dolphins in Komodo and on our ferry crossing from Bali to Java, and in both instances there weren’t lots of boats chasing the dolphins. If you’re unsure whether to do a dolphin watching tour in Lovina, we recommend reading this article. 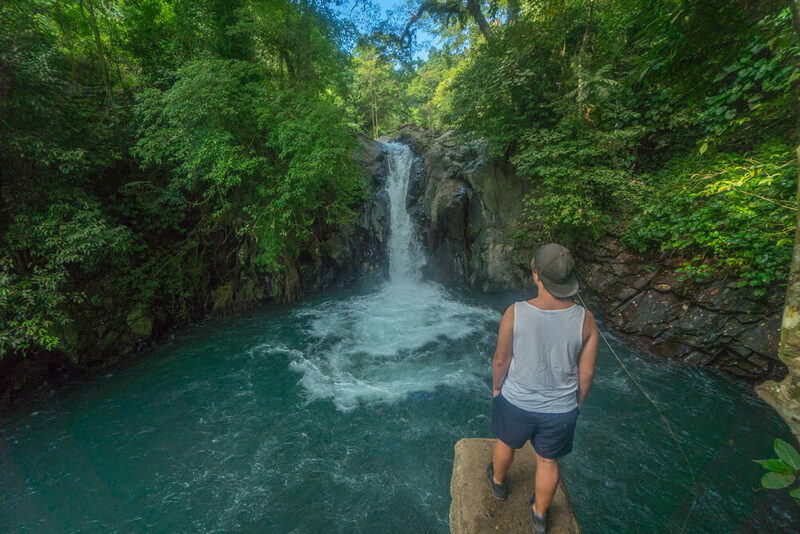 Aling Aling trek – If you’re looking for some adventure in Bali, consider a visit to Aling Aling waterfall. There are a number of waterfalls in the area – many of which you can jump from into pools below. In fact, at Kroya waterfall it’s even possible to slide down the falls themselves! Aling Aling itself is the tallest waterfall in the area standing at around 35 metres. It’s not possible to swim in the Aling Aling waterfall as the water is considered holy. Aling Aling is around a 40-minute drive from Lovina. If you want to swim and jump into the falls then a guide is mandatory. Entrance with a guide costs 125,000 IDR per person and requires a minimum of 2 people. There is also the option of medium and longer treks at 250,000 IDR and 375,000 IDR per person respectively. Alternatively, entrance costs just 10,000 IDR per person if you’re happy to explore the falls on your own and don’t want to swim. Warung Apple – A great option for a budget meal in Lovina. Warung Apple serves tasty Indonesian and Western dishes, with meals starting at around 20,000 IDR. Global Village Kafe – A café making a positive difference in the world. Run as a not for profit, all proceeds go towards assisting in housing, healthcare and education for the disadvantaged and disabled in North Bali. Global Village Kafe offer both Indonesian and Western cuisine at very reasonable prices. Click here to see the menu. 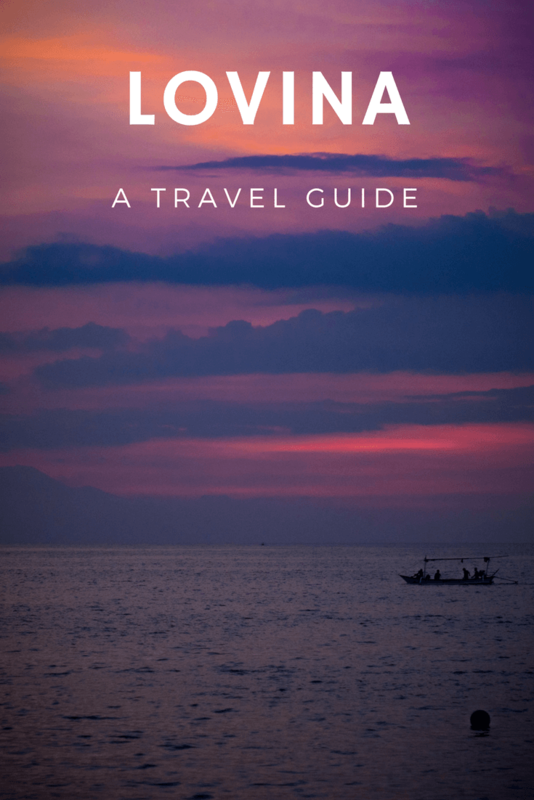 Like this Lovina guide? Pin it!